Sat., Oct. 15, 2016, 8:29 a.m.
A GRIP ON SPORTS • We are headed for another late night tonight in Pullman. A football Saturday that may just finish Sunday. And there’s is another local college athlete in trouble with the authorities, though this time in Spokane. What the heck is going on here? Read on. • Sports has changed in many ways over the past 10, 20, whatever years. But what should we expect. It isn’t your grandma’s world anymore, after all. In the athletic arena, though, there have been enough changes to make one long for the days when every college football game was held at 1 p.m. and every player wore a sweater with a big letter on it. Actually, though, I’m not sure those days ever existed. Television has opened the world of sports to just about everyone. If you want to watch your beloved Huskies in Singapore, you can. Maybe even at 1 p.m. on a Saturday. Of course, that means it is 10 p.m. Friday in Seattle. There is a chance, with the way games are scheduled these days, they are playing. That’s not the way it was, of course, 40 years ago but everything has a tradeoff. Big money means big changes. It’s the way of the world. But big men on campus? They have always been there – and most of the time they are athletes. I’m sure the day after Harvard played Yale for the first time on the gridiron, the Crimson’s best running back was Teddy Roosevelt's hero. 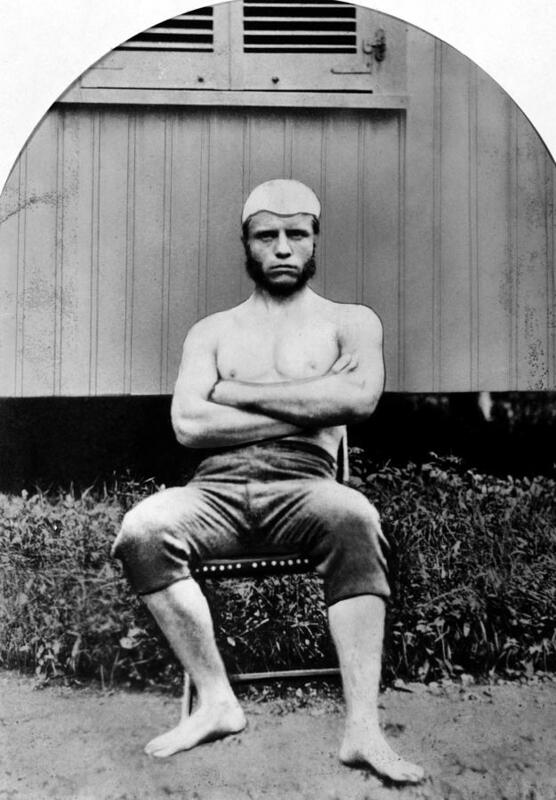 (That's Harvard football player Teddy Roosevelt, from a few years later, in the picture above.) And probably got away with stuff other students didn’t. Which brings us to the duties of high-profile college athletes. What was it Spider-man’s uncle told him in that old movie? With great power comes great responsibility? The young men and women selected to represent their universities on the pitch or field or court have a bit of a burden that goes along with the perks. They are usually too young to be considered full-fledged adults – they can vote, get married and die in wars, but aren’t legally allowed to drink – but they are expected to act like one. At all times. Other students are given more leeway, but, as uncle Ben said, with great ticket receipts come great scrutiny. Or something like that. Those responsibilities were not carried all that well over the summer by some Washington State football players. That's been well-documented. And now a Gonzaga basketball player, guard Josh Perkins, has also stumbled in that regard as well. Our Tom Clouse has the story. Perkins, a junior in school but a redshirt sophomore athletically, was cited last Sunday morning for being in physical control of a vehicle while intoxicated. The citation was issued at 4 a.m. There are fewer athletes in the Inland Northwest with a higher profile than Gonzaga basketball players. Maybe a couple of WSU football guys. Maybe. But Zag hoopsters are rock stars around here. Heck, it seems they are on television more than Spokane’s mayor. And are a lot more popular, no matter who fills the mayor’s chair. Which means if they mess up, sooner or later we all are going to know about it. A college student out in the early hours of a Sunday under the influence is nothing new. But, to paraphrase uncle Ben again, with great basketball ability comes great accountability. Over the years the Zags have had players who liked to be out at the wee hours of the morning. Many of them were in the gym shooting. Some were doing other things. The former were obsessively trying to improve their game – and help their team improve. The latter were letting themselves and others down. But there is one thing about being young and immature. You are certain to grow out of the former and have a good chance of shedding the latter. Perkins made some bad choices. Probably a whole bunch in just a few hours. The good news is, in this case it doesn’t sound as if anyone was hurt. If he can absorb lessons from what happened, then the episode can illustrate something college is supposed to supply: a learning experience. Just like his peers – using that term in a “getting-in-trouble-with-the-authorities” way – in Pullman, he will pay a price. And just as we said of the incidents farther south, they are deplorable and shouldn’t happen. Whether they will ever stop, however, isn’t debatable. They won’t. People make mistakes. And that’s a part of college athletics – and life – that hasn’t changed. • WSU: There is a chance it will be wet in Martin Stadium tonight. But who does that help? Jacob Thorpe posits it is the Cougars, who are running the ball well. ... Jacob also has his 2-minute drill. ... The WSU volleyball team has lost two consecutive Pac-12 matches. ... Gabe Marks does have one individual record he would like to grab. Stefanie Loh has the story in the Times. ... It is still unsure whether Josh Rosen will play quarterback for the Bruins tonight, but it is their ground game that must show up. Today in the Pac-12, Stanford will represent the conference on the national scene when they play at Notre Dame in a game that’s lost a lot of luster. ... Arizona State will try to stay atop the South when it visits Colorado. ... Oregon State is attempting to have an actual winning streak as it hosts Utah. ... USC’s calmness will be tested as it travels to Tucson. ... Oregon, California and Washington have byes, with the Huskies toughest test in the season’s second half will probably be in Pullman. ... John Blanchette wrote about these guys early this year, but Paola Boivin goes into more depth concerning Phoenix College and its coaches, G-Prep alum Dan Cozzetto and former WSU assistant Robin Pflugrad. • Gonzaga: Other than the Perkins’ news there isn’t much from the Zags. • EWU: The Eagles have a bye today but around the Big Sky there is still a lot of action. Weber State, undefeated in conference play, hosts a disappointing Montana State team. ... North Dakota, also yet to lose in conference, hosts Southern Utah. • Idaho: The Vandals were selected second by the coaches in the Big Sky basketball preseason poll. • Whitworth: The Pirates are at Pacific Lutheran today. Tom has the preview. • Chiefs: Coming home wasn’t the cure for Spokane as it yielded two late goals and lost 4-3 to Everett in overtime. Tom has the game story. • Preps: A lot of action around the area last night, with the biggest game coming between two smaller schools. Greg Lee was in Liberty last night to cover Northwest Christian’s 36-26 win over the Lancers. Colin Mulvany was also there and has this photo report. ... Out at Albi, Kevin Dudley has coverage of Mt. Spokane’s 30-0 win over North Central and Shadle Park’s 26-0 win over Rogers. ... Central Valley got past Lewis and Clark 20-3 as well. ... The big game in Idaho pitted district rivals Coeur d’Alene and Lake City with the Viks winning 53-27. Jim Meehan has the story. • Seahawks: With Tyler Lockett and Russell Wilson returning to health, the Hawks now have to deal with injuries on the other side of the ball. The big one: Kam Chancellor, who is a game-time decision. • Sounders: Seattle will be without a key midfielder for the rest of the regular season at least.